The United States is on pace to hit a 90 percent graduation rate by the year 2020, according to the 2015 Building a Grad Nation Report released Tuesday. According to Civic Enterprises CEO John Bridgeland, the national graduation rate stands at 81.4 percent, which is an 11 percent point gain over the past 10 years. These gains have been made possible by rasing graduation rates among groups of students that have tradtionally struggled to earn a high school diploma. Districts with majority low-income and minority students are making big gains. Additionally, Hispanic and African-American Students graduation rates have improved significantly. According to the report, Hispanic students have improved 15 percent and African-American Students improved 9 percent. Still, much work remains to be done in order to improve our national graduation rate to 90 percent by the year 2020. Large and persistant opportunity gaps still exist within the education system. Rates of improvements among states and large districts varied considerably between 2011 and 2013, with some making big improvements while others lost ground. How does this information impact Central Indiana? 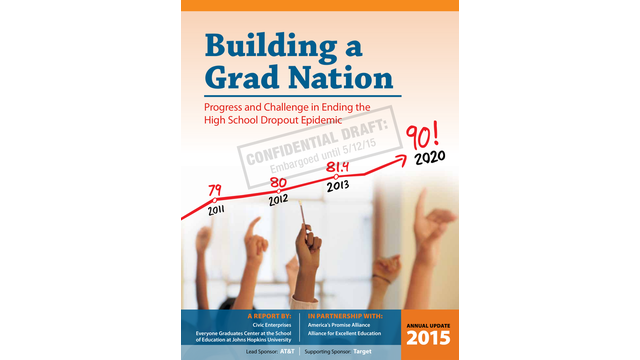 What is our role in moving the national graduation rate forward? How do we continute to support low-income students, minority students, and students with disabilities? We invite you to learn more. Join us Tuesday, May 19th 6:00pm at Central Library to hear first-hand from John Bridgeland about how Indiana can help to support students and improve the national graduation rate. More information linked below. Also be sure to tune in to No Limits next Tuesday, May 19 at 1:00pm, where John Bridgeland will be featured. What are you looking forward to hearing more about during the Builing a Grad Nation event? Share your thoughts and follow along with this and other WFYI American Graduate conversations on Facebook and Twitter using #AmGradIndy.